I have made many styles of banana bread throughout the years. Some large loaves. Some in muffin form. Some with chocolate chips included. Some with a crumb topping. Some have been successes. And, some have been down-right flops. This recipe, however, has become our family’s favorite banana bread. It’s not often that every single household member - all five of us - in the JD home agrees that a specific recipe is a winner. I have somewhat of a picky gang to feed. With this banana bread, every single one of my crew couldn’t get enough of these adorable, scrumptious loaves of banana bread goodness. I combine finely-crushed graham crackers with the flour in this recipe. 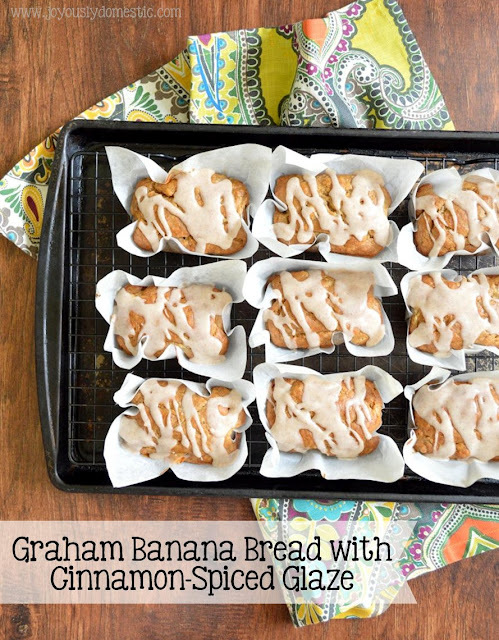 The result makes for a slightly chewier bread with a subtle flavor note of graham. A plethora of autumn-style spices come together, as well, in this bread that really enhance the banana flavor. But, it's the simple cinnamon glaze that - in my opinion - take these little breads over the top. It's an easy recipe that doesn't take long to prepare. Frankly, waiting for the breads to fully cool prior to glazing (and eating) is the hardest part. Preheat oven to 350 degrees. Line the wells of a nine-count individual-style loaf pan with small and equal-sized rectangles of parchment paper. Lightly mist parchment paper (once pressed into wells) with non-stick spray. Alternately, if choosing to not use parchment paper, simply spray each well with non-spray thoroughly. (Use of parchment paper makes removal of loaves easier and ensures that the loaves do not stick.) Set aside. NOTE: Three traditional mini (5 3/4” x 3 3/4”) loaf pans can be used instead of the individual style. Baking time, however, may be a few minutes longer. In a large mixing bowl, combine together flour, graham cracker crumbs, baking powder, baking soda, salt, cinnamon, ginger, nutmeg and clove. Make a well in the center of the dry ingredients. Add mashed banana, both sugars, oil, buttermilk, egg and vanilla extract into well. Slightly combine wet ingredients, then blend wet and dry together until everything is well-combined. Divide batter evenly among the nine wells. Bake for 28 - 30 minutes. (Rotate pan halfway through to ensure even baking.) To test for doneness, a toothpick inserted in the center of a loaf should come out “clean” when cooked through.) Remove from oven. Cool in pan(s) on a wire rack for fifteen minutes, then remove loaves from pans(s) and cool on wire rack fully prior to glazing. Once loaves are cooled, whisk together glaze ingredients in a small bowl. If necessary, additional milk or powdered sugar may be needed to reach desired consistency. Glaze should be easily drizzled, but not overly runny. Drizzle glaze evenly over loaves. Best chilled in refrigerator for about thirty minutes prior to service. Alternatively, store breads in an airtight container at room temperature or in an airtight container in refrigerator for up to two days. Breads can be wrapped well in foil or plastic wrap to be placed in freezer baggies for freezer storage, as well. Recipe adapted from Tutti Dolci.